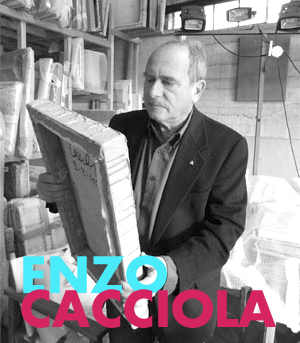 The works of Enzo Cacciola show continued research on the painting technique, typical of the Seventies, which led to the birth of the analytic movement. The surface, the matter and their interaction are the basic elements of the Cacciola's style. In the seventies, his research led him to use a strange material to painting techniques, the cement. In this way we have canvases covered with layers of cement, stretched like tempera. The artist intervenes on the matter itself but never detaching from the painting technique.